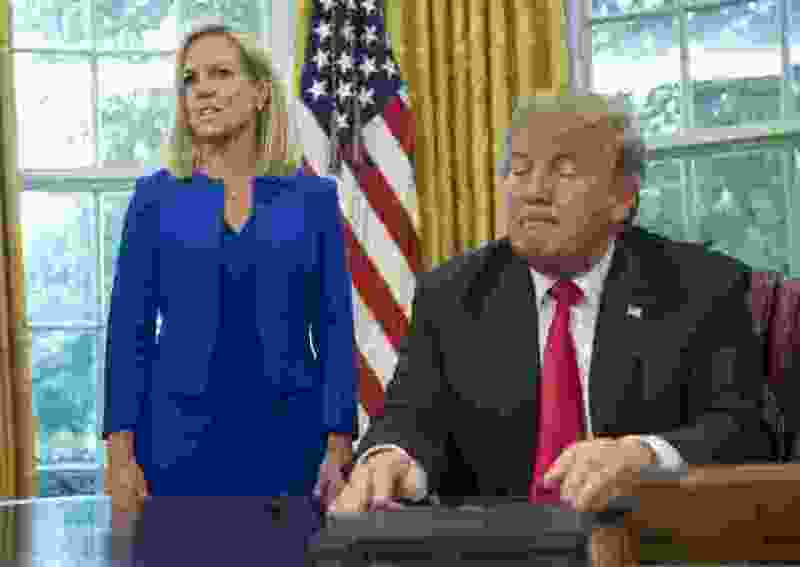 (Pablo Martinez Monsivais | The Associated Press) In this June 20, 2018, file photo, President Donald Trump, right, listens as Homeland Security Secretary Kirstjen Nielsen, left, addresses members of the media before Trump signs an executive order to end family separations at the border, during an event in the Oval Office of the White House in Washington. Washington • With the partial government shutdown headed toward its second week and no resolution in sight, President Donald Trump on Friday issued a string of tweets in which he once again vowed to close the entire U.S. border with Mexico and halt aid to several Latin American countries unless Democrats agree to his demand for billions of dollars in wall funding. The House and the Senate convened for just minutes on Thursday before gaveling closed until next week. During the brief session in the House, Republicans shot down a Democratic attempt to vote on legislation to reopen the government. Even though Trump will be in town and Republicans control both chambers of Congress, Mulvaney acknowledged that little progress on a deal is expected until the start of the new Congress on Jan. 3, when Democrats will retake the House. Contending that Democrats “have simply shut down the discussions,” he sought to place the blame on House Minority Leader Nancy Pelosi, D-Calif., who is expected to be elected speaker in the new Congress. Pelosi's spokesman, Drew Hammill, said in a statement Friday that Democrats "are united against the President's immoral, ineffective and expensive wall — the wall that he specifically promised that Mexico would pay for." The Washington Post’s Erica Werner and Paul Kane contributed to this report.